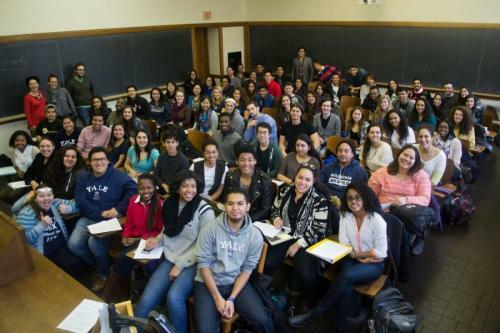 In the 20 years since it was established, Yale’s Ethnicity, Race and Migration Program has grown significantly in both programming and size — particularly in the last two years — thanks to student interest in burgeoning fields as well as University support. The number of declared students in the major has nearly tripled since 2015, according to department chair Matthew Jacobson, who attributed the growth to the program’s faculty and course offerings, as well as a historical moment in which larger numbers of students are drawn to courses that tackle subjects of race, migration and ethnicity. There are currently 32 seniors, 29 juniors and eight sophomores declared in the major, Jacobson said, up from “a handful” just a few years ago. In the fall of 2015, when more than 1,000 students marched to protest a racially hostile environment on campus, there were 23 declared ER&M majors, as compared to the current total of 69. Jacobson said that last year’s graduating class — the program’s largest ever — had 15 students, which is nearly half as big as this year’s. In previous years, he said, graduating classes were as small as six or eight. Camacho, who has been at Yale since 1998, said she has seen ER&M grow from a secondary undergraduate major — which students could only take in addition to a first major until several years ago — to a standalone major with its own postdoctoral fellows and working groups. The program fosters academic inquiry in underrepresented fields in ethnic, postcolonial, indigenous and critical race studies, Camacho said. She added that beyond the undergraduate major, ER&M supports graduate students and faculty, hosts visiting scholars and promotes the hiring of faculty of color. The growth of the undergraduate program reflects the centrality of intersectional studies of race, migration, postcolonial realities and indigeneity to Yale students, Camacho added. “ER&M could only exist because of a shared commitment to minoritized fields of inquiry and teaching, which I think gives our teaching a special degree of immediacy in the classroom,” she said. Students have flocked to ER&M courses this semester in unprecedented numbers, Jacobson said, adding that course numbers add up to the highest enrollments the program has ever seen. The course with the largest number of enrolled students is “Race, Class, Gender and American Cities” with 247 members, he said. The program is also building up its faculty, Jacobson said. He added that in the two decades since its founding, the program has largely existed on “borrowed” faculty to make up for understaffing in academic areas like Asian American, Latinx and Indigenous studies, a trend that is beginning to change. ER&M welcomed its first two senior faculty hires this fall, Ana Ramos-Zayas ’90 and Daniel HoSang. Jacobson said these departmental additions, as well as the hiring of both ethnic studies pioneer Gary Okihiro and refugee studies professor Quan Tran GRD ’15 on a multi-year basis, are the result of resources made available after the student protests in fall 2015. “Faculty have been arguing for the importance of ethnic studies all along, but there’s no question that the administration became newly attuned as a result of the events here in 2015,” Jacobson said. Camacho also praised the program’s new hires and expanding curriculum, adding that its biggest challenge is hiring and retaining faculty. Dozens of valued scholars have left the program over the past two decades, she said, which is not only a concern of faculty diversity but also of the program’s capacity to cover wide-ranging academic topics. Still, the University has seen several high-profile faculty of color depart in recent years amid calls for greater inclusivity and more resources. These recent senior hires usher in a new period of stability for the program, Jacobson said, as does the advent of Yale’s Center for the Study of Race, Indigeneity and Transnational Migration, which was established in February 2016 and now houses the department. RITM founding director and history professor Stephen Pitti said that, in recent years, students have reminded the central administration and department chairs that Yale needs more scholars working in fields including Latinx Studies, critical refugee studies, Native American Studies and Asian American Studies, and the administration has been increasingly responsive to the program’s needs.